Commonly known as the "Dungeon," the city of Orario possesses a huge labyrinth in the underground. Its strange name attracts excitement, illusions of honor, and hopes of romance with a pretty girl. In this city of dreams and desires, new adventurer Bell Cranel has his fateful encounter with the tiny Goddess Hestia. Thus begins the story of a boy striving to become the best adventurer and a lonely goddess searching for followers both working together to fulfill their goals. 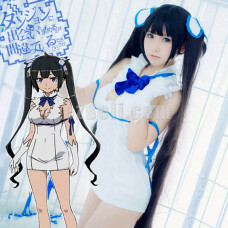 Material : Polyester Fabric Include : Head Ribbon, Cosplay Dress, White Gloves, Neck Ribbon, Long..